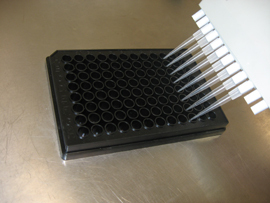 Ferric Reducing Antioxidant Power (FRAP) Assay Kit | Cell Biolabs, Inc.
OxiSelect™ Ferric Reducing Antioxidant Power (FRAP) Assay Kit is a quantitative assay for measuring the antioxidant potential within various samples. Following the reduction of ferric iron (Fe3+) to ferrous iron (Fe2+) by antioxidants present in the sample, the kit colorimetric probe develops a blue color that is read colorimetrically at 540-600nm. The antioxidant potential of samples is determined based on an iron standard curve and results are calculated at Fe2+ equivalents (µM) or FRAP value. Hosokawa, Y. et al. (2016). Ascorbic acid does not reduce the anticancer effect of radiotherapy. Biomed. Rep. doi:10.3892/br.2016.819.